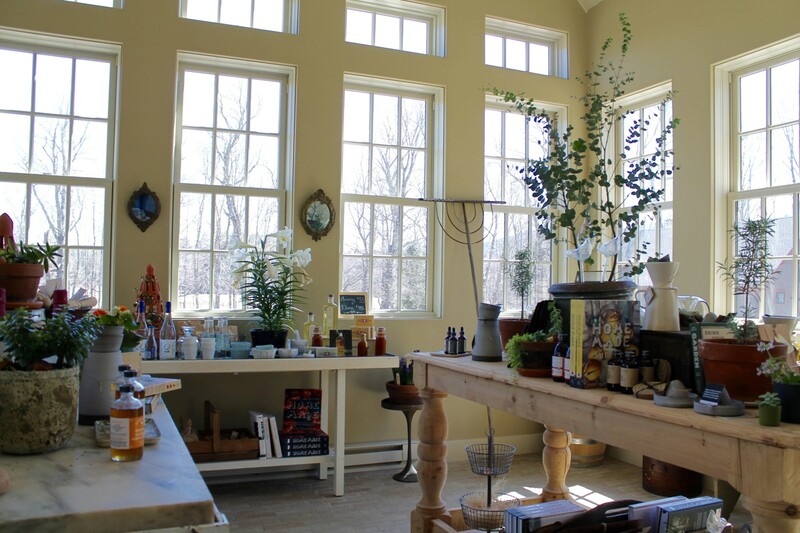 Transcendentalist spirits have found a natural home in rural Tamworth, New Hampshire. Founder Steven Grasse is to thank, conceptualizing both Tamworth Distilling and Lyceum in town. Former ad man for MTV and R.J. Reynolds Tobacco Company, Grasse also conceived Hendrick’s Gin and Sailor Jerry Rum. His 2008 sale of the latter prompted his purchase of a summer home in Tamworth, where his forthcoming venture was soon to flourish. Grasse’s ideology and concept appeared destined to thrive even beyond the likes of a city. 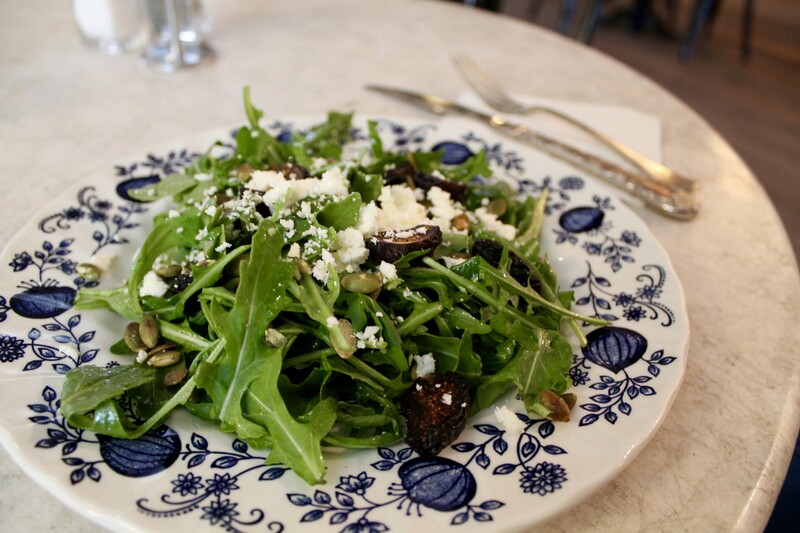 As past Philly dwellers, we are well aware of the bustling food and art scene in Philadelphia. It is no surprise that we became familiar with Grasse’s Art in the Age of Mechanical Reproduction. Art in the Age houses its own retail shop in the heart of Old City Philadelphia, stocked with Warby Parker frames, local artisan goods, and their four keystone spirits (our personal favorites include Root and Snap). Root, Snap, Rhubarb, and Sage each have their own story, but primarily draw inspiration from Pennsylvania Dutch heritage. The botanist teachings of Philadelphia icon, Benjamin Franklin, and Thomas Jefferson play into the recipes and narratives of these spirits, yet all four of these original libations are distilled in California. Steven took ownership of his first distillery in New Hampshire, in which to feature a line of Tamworth Distilling products and Art in the Age limited edition spirits. The two-hour drive from Woodstock to Tamworth offers views of White Mountains, as well as a peek of Lake Winnipesaukee’s glistening blue waters. Found amongst rural fields of crops and livestock, Grasse’s new Distillery and Lyceum were designed to masterly fit Tamworth’s historical downtown landscape. Grasse built his distillery in 2011, after gaining enough local support to build on the former grounds of the Tamworth Inn. In true New England fashion, Grasse’s company continues to work alongside its community as an integral component of Tamworth. Emphasis on locality and history run deep, as seen with the Distillery’s old world-inspired recipes. Drawing from their bucolic New Hampshire surroundings, the distillers forage for native ingredients to incorporate in their mixtures. 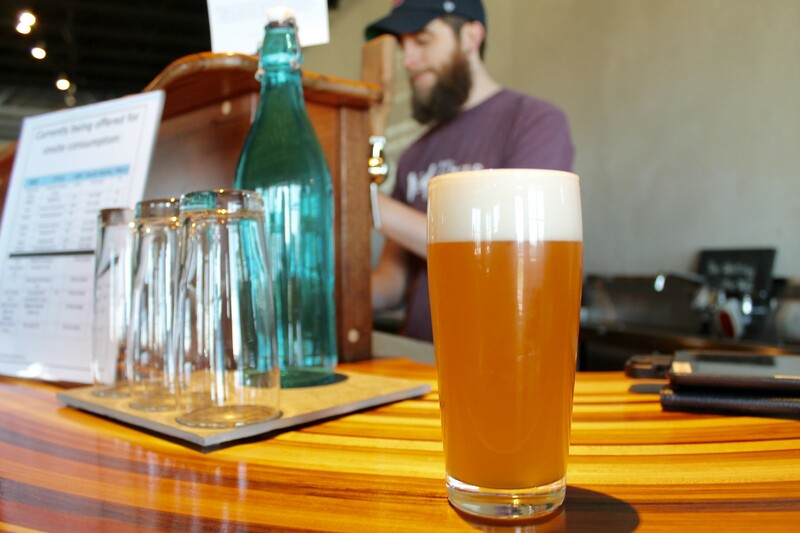 Their Black Trumpet Blueberry Cordial, for example, includes small and flavorful blueberries from local BerryKnoll Farm, as well as black trumpets from the New Hampshire Mushroom Company. Tamworth’s Beet Root flavored vodka also relies on locally harvested cranberries from a bog 15 minutes away. The distillers reap cranberries from this old, forsaken cranberry bog, where locals unhesitatingly stake their fair share every fall. Further, raised garden beds lie just behind the Distillery. Everything grown there is edible and used for recipe experiments. Distiller Jamie Oakes notes that New Hampshire is happy to have this sort of thing thriving in the state. While certainly not as huge as other liquor producers in the area, New Hampshire has embraced this distillery as an outstanding artisanal maker. Grasse and his distillers share a mutual love for the Granite State as well. Jamie went to school for illustration and lived in Philadelphia when Steven asked if he’d be interested in returning to his home state. Back in New Hampshire, Jamie is “happy to be amongst the mountains, trees, and rivers once again.” Even Steven’s brother, a Philadelphia native and the Distillery’s day-to-day operations manager, couldn’t fit in better. An avid fisherman and proud yellow lab owner, David appears to be a true New Englander at heart. 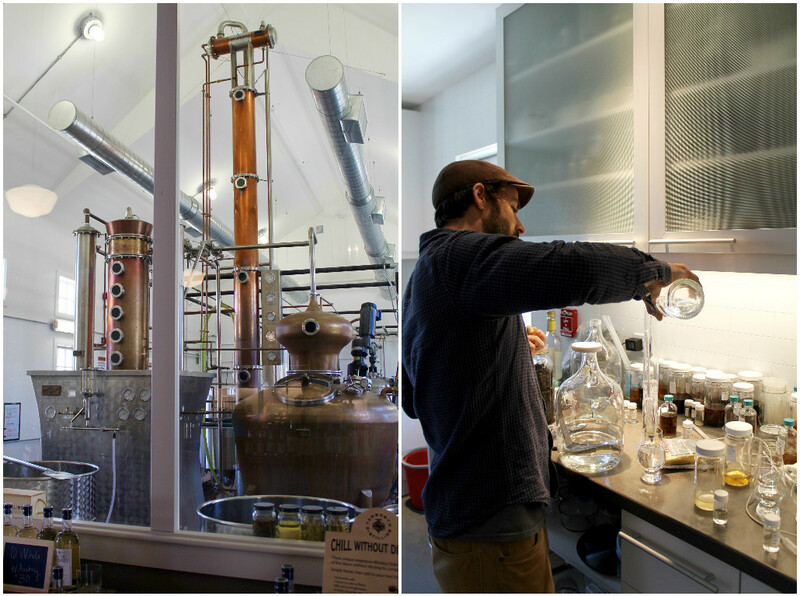 Not only is New Hampshire good for the soul, it is also good for distilling. New Hampshire’s granite helps preserve the water here. While Grasse’s home state of Pennsylvania is threatened by fracking, the Ossipee Aquifer is one of the purest water sources on the East Coast. After all, good water is the true base of a great spirit. 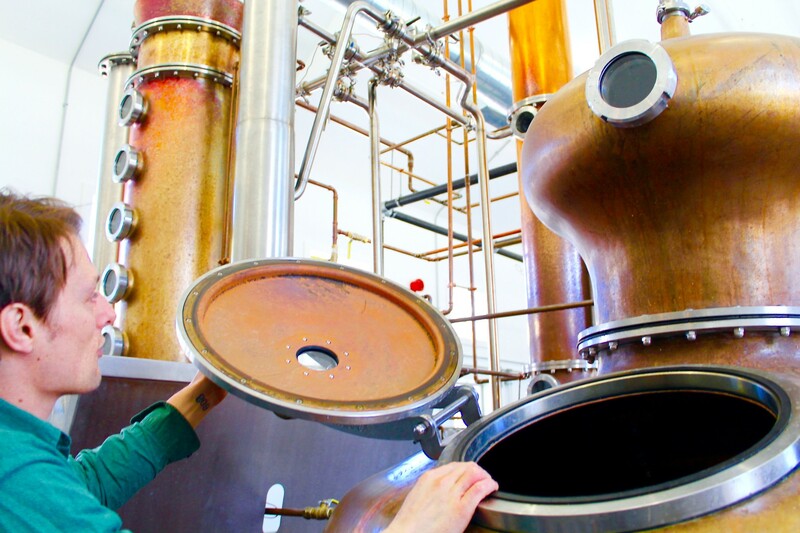 With exceptional ingredients at their fingertips, Tamworth distillers have the company’s full support in utilizing their practical chemistry skills. 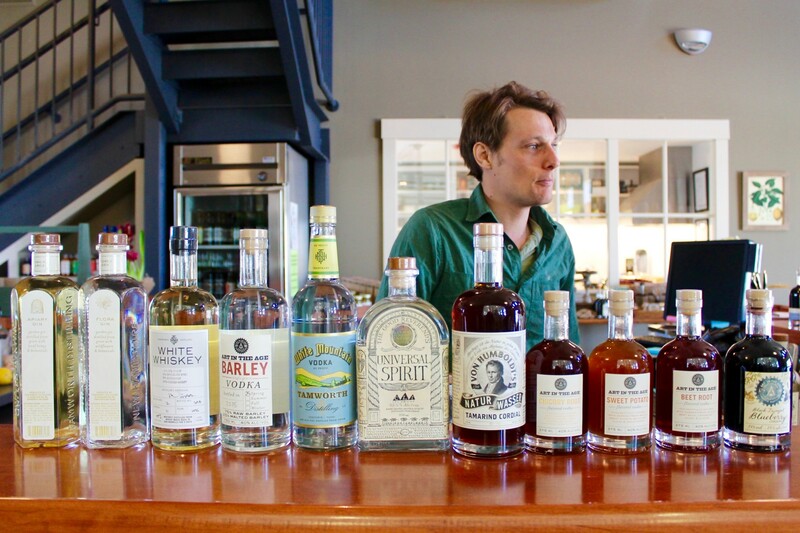 The Distillery’s test kitchen emanates a “kid in a candy store” feel. Test tubes full of flavor essence line the counter, The Flavor Bible lies bookmarked and open on the workman’s stool, and a sous-vide machine sits amongst fresh produce in the corner. In sampling the test tube contents, Distiller Matt Power notes the intrigue in deconstructing the components of what we familiarize as ginger or juniper – key ingredients in a couple Tamworth libations. 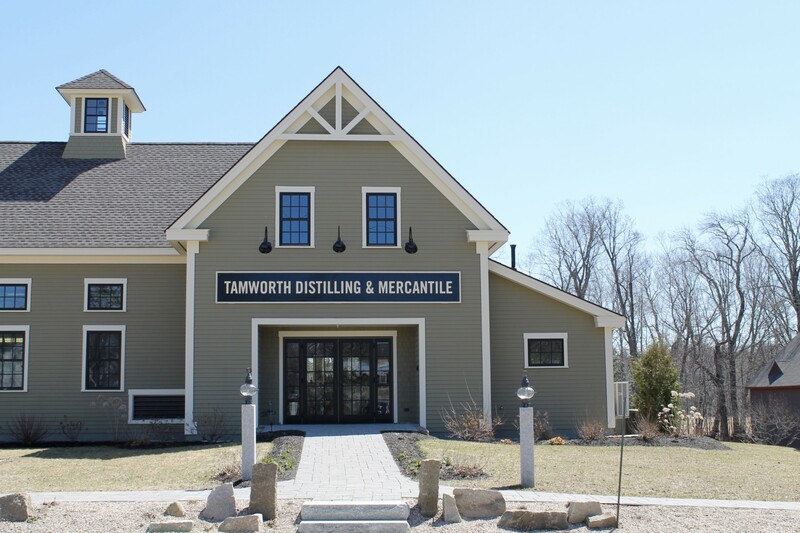 Tamworth Distilling has certainly taken flavor profiles to the next level in interpretation and association, as evidenced in their strategically balanced and uniquely blended spirits. 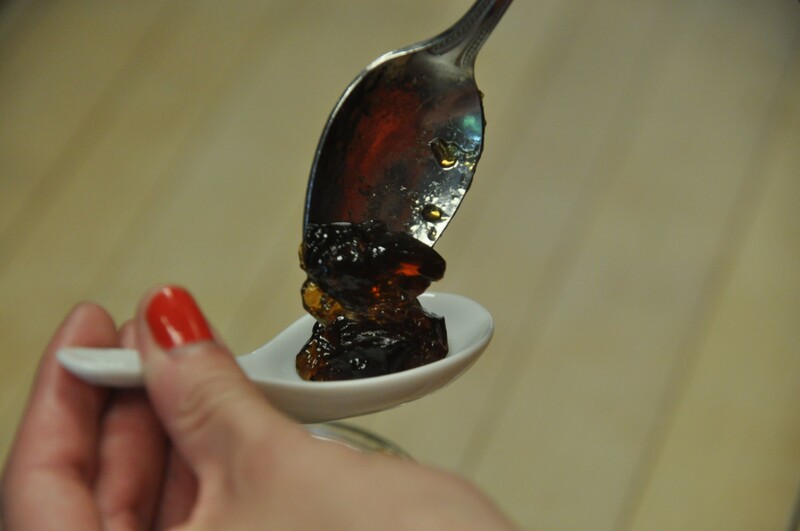 The mad scientists of the test kitchen have discovered liquid gold – quite literally. 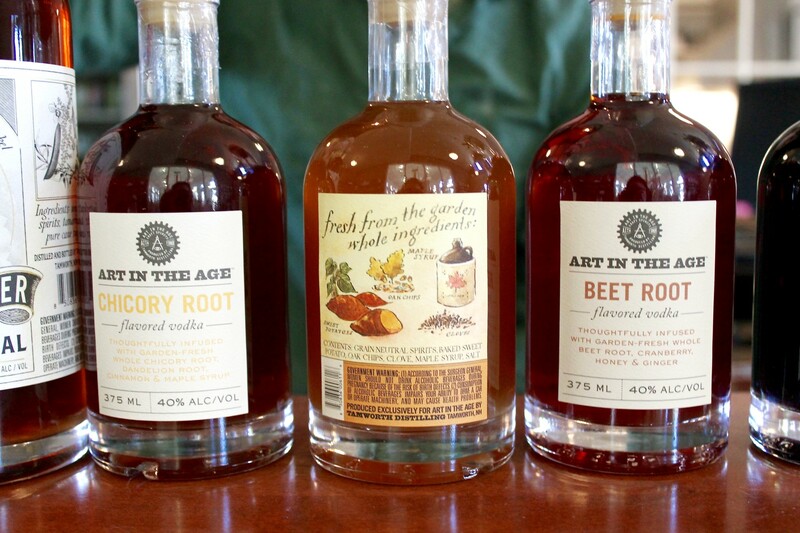 Their Beet Root spirit earned the highest distinction of double gold and best in class, while the Chicory and Sweet Potato flavored vodkas both earned gold at the San Francisco World Spirits Competition. To be recognized amongst distilling heroes, such as Four Roses Bourbon, this “funny bunch in Tamworth” can’t help but feel like they have a good thing going in this small New England town of theirs. The flavored vodkas, in particular, embody Grasse’s “aha!” moment. Wanting to differentiate from chemical medleys such as birthday-cake-flavored vodkas, Steven came to the realization that integrity should be the new indulgence. 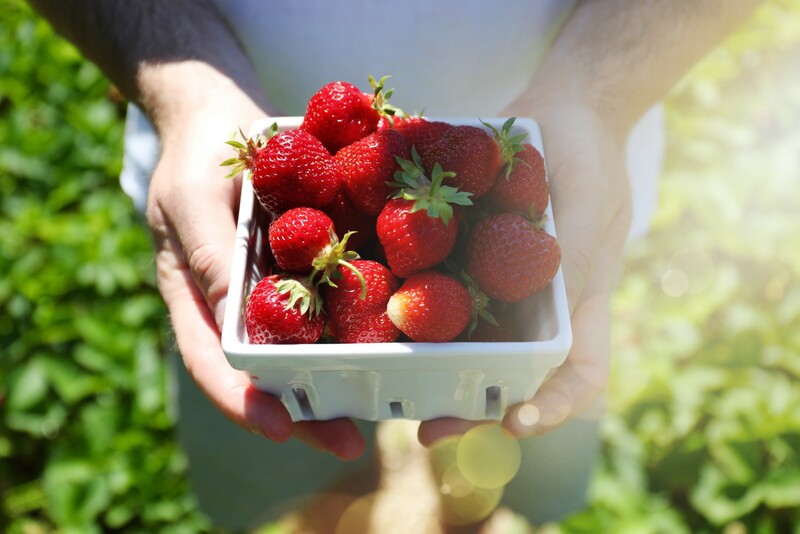 Enter the organic and naturally foraged ingredients used at Tamworth Distilling. The Art in the Age spirits, in all actuality, defy the flavored vodka classification in the traditional sense. Being the closest to vodka than any other spirit, Tamworth’s Art in the Age editions have nonetheless won numerous awards in their category. This is of no shock to us. 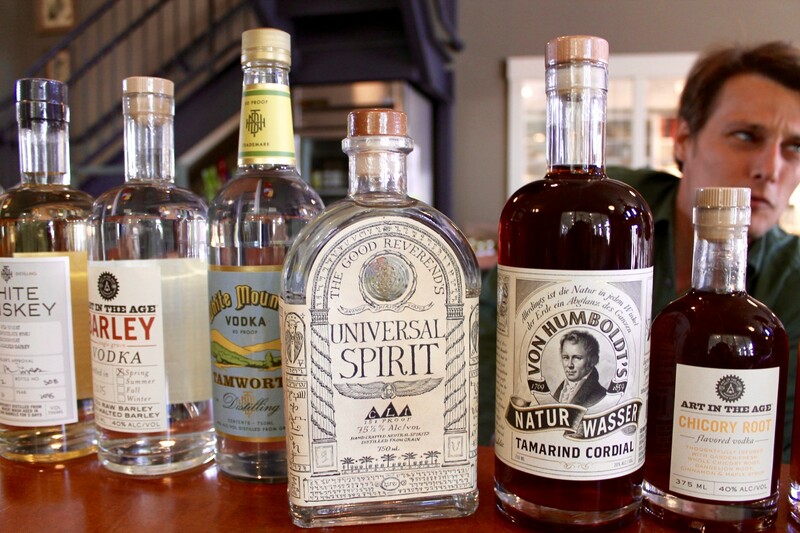 Sipping on each spirit in Tamworth’s tasting room, we are most enamored with the Blueberry and Sweet Potato mixtures. The Black Trumpet Blueberry Cordial embodies notes we recognize as grandma’s Maine blueberry jam, mixed with the subtle earthiness of black trumpet mushrooms. We envision this spirit to be the perfect ingredient to work with in our Jackson House breakfasts. The maple syrup and clove undertones of Art in the Age’s Sweet Potato flavored vodka also strike us as the perfect base for an autumnal cocktail. The bottles of all Distillery products line the bar of the tasting room. Many of the bottles, Art in the Age included, don distinct labels created by the ever talented Reverend Michael Alan. The Good Reverend’s Universal Spirit acts as a blatant nod to the illustrator, the label of which impressed the Alcohol, Tobacco, Tax, and Trade Bureau as the most elaborate design they’ve encountered and approved. The Reverend worked the entire label, inside and out. Intricacy must have blinded the bureau, who gave zero flack in return. The artwork displays “a mixture of English and Latin, the Theban, and Adamic alphabets, and various magickal sigils for peace and love and prosperity.” The label takes to the extreme Grasse’s belief that great liquor brands require three things: an interesting bottle, intriguing story, and great liquid. Great liquid may be easier said than done. Tamworth Distilling cuts no corners in the making of their product. Organic grain is milled on-sight in an explosion-proof room and different yeasts are boiled to create varying flavors, sometimes emanating banana or fruity aromas. These steps embody the building blocks of the spirits. Most notably, Tamworth prides itself as one of the first small distillers to utilize a Centrifuge in their system. The Centrifuge is an over-and-beyond step that the Distillery takes no hesitation in implementing. This machine finely separates the liquid and solids from their original mixture in an effort to filter as much liquid as possible. In a nod to sustainability, the Distillery uses the spent grain solids for pig and chicken feed, compost, and even Distiller’s Bread. Future plans? 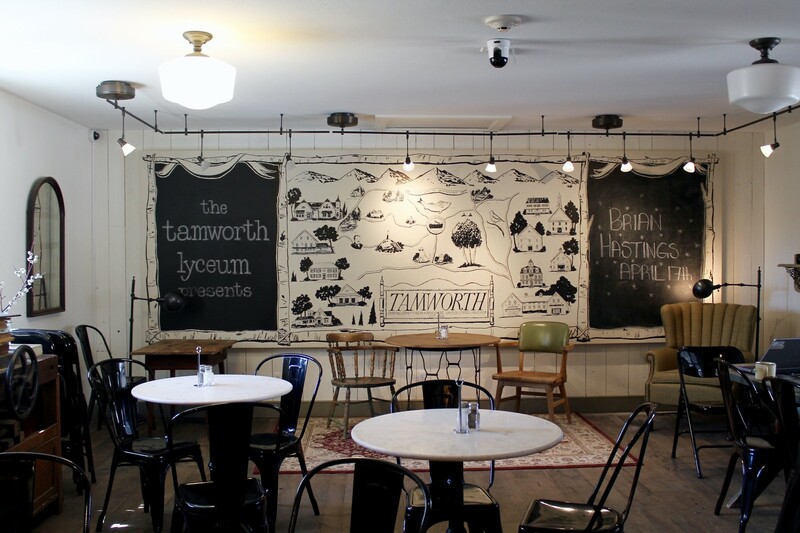 Tamworth’s Distillery and Lyceum are rich in history and potential. 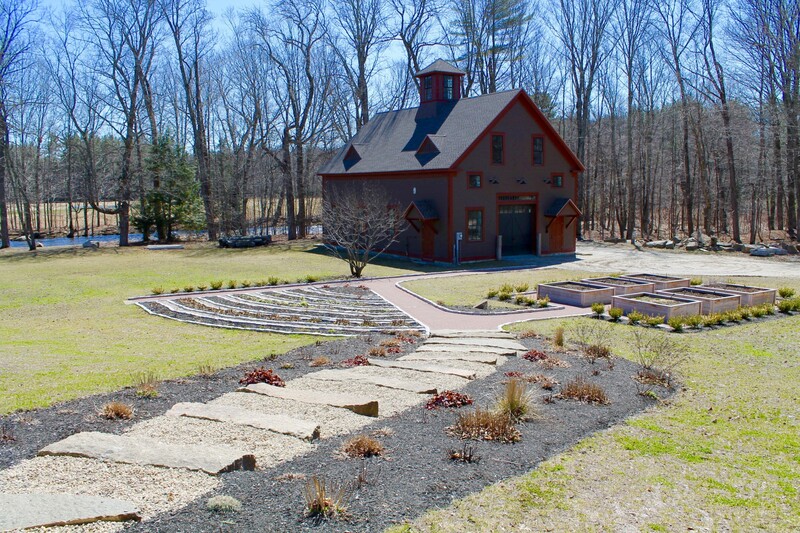 The Tamworth Garden, for example, lies behind the Distillery’s vegetable garden. This old fight hall has transformed into a temperature-controlled barrel house. A third building on the grounds remains vacant – the ideal space for Grasse’s upcoming restaurant. Instead of simply offering spirit tastings, a restaurant will allow the distillers to stretch their undoubtedly supreme mixology muscles. Beyond these grounds, about 2 minutes into town, lies the Tamworth Lyceum. Marble cafe tables and galvanized chairs accompany the mercantile, where light grocery, dry goods, literature, and outdoor gear are available. Lyceums were started in Greece by Aristotle, where he would lecture in gardens and public buildings. By the 19th century, adult communities in the United States caught on to the idea of lyceums for intellectual curiosity. Grasse has now created a “modern day New England Lyceum,” in which to pique community ideas and discussion with events covering an array of topics. 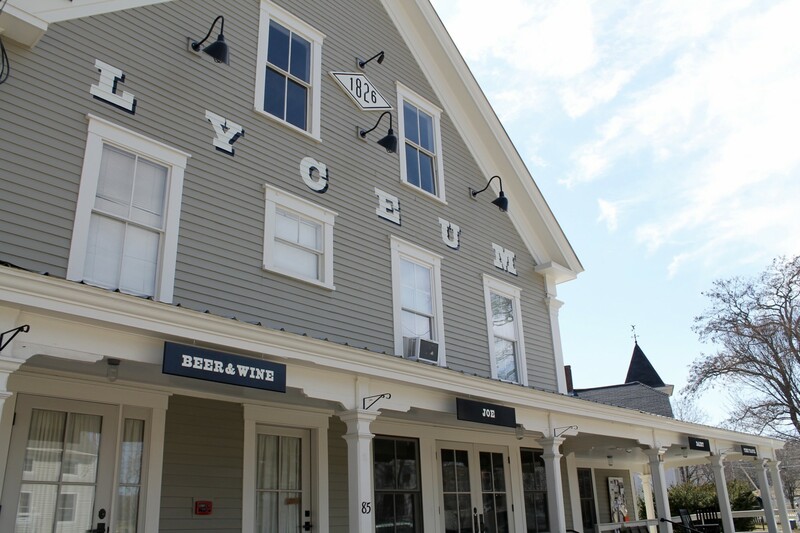 A very agricultural act, Steven and his wife are seasoned visionaries who’ve reflected this experience in the retail space of both the Distillery and Lyceum. The spaces’ merchandise and aesthetic are reminiscent of what we were constantly drawn to in Philadelphia – a cultivated ambiance chalk full of quality, artisanal goods. If the eats in the Lyceum are any indication of the restaurant’s forthcoming menu, another trip to Tamworth will most certainly be happening sooner than later. Thank you David, Matt, and Jamie for touring us around the Distillery. Your knowledge and enthusiasm are contagious. We look forward to sharing the cocktail recipes we conjure up in the near future!